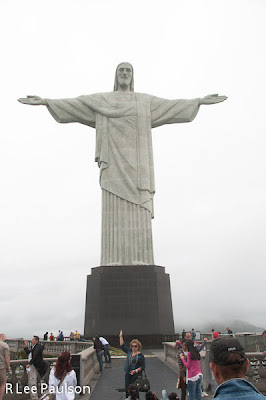 Also as part of our tour, that overcast second day of our trip in Rio de Janeiro, they took us up to to see a huge, 130 foot, statue of Christ, which stands on top of Corcovado mountain at an elevation of 2329 feet above sea level. In order to get us up to the top of the mountain, which is located not that far from Ipanema Beach, we needed to ride a cog train. You can see the cog rail in the center. 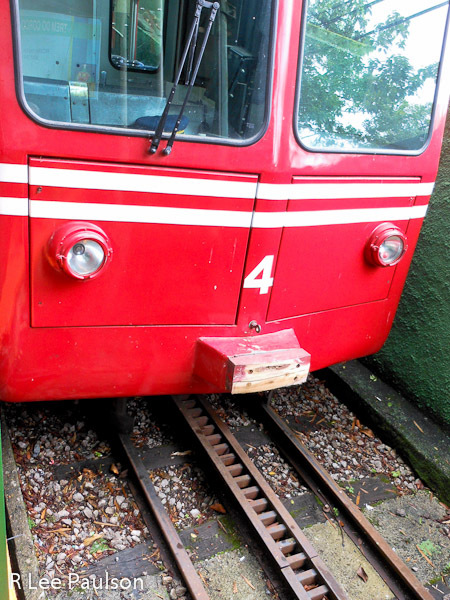 Here's a close up of a different train. 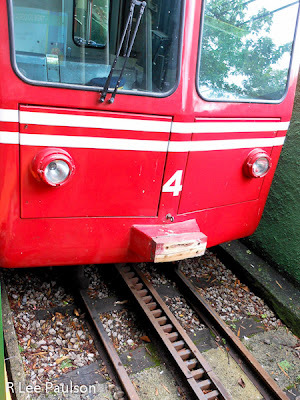 Using that notched track, a cog wheel connected to the train's motor, literally pulls the train up the mountainside. Fortunately for us, when we arrived at the mountaintop statue in the late afternoon, the clouds had lifted just enough for us to get a glimpse of both the statue and the scenery below. This statue is a prominent landmark in Rio de Janeiro. It's the 5th largest statue of Jesus in the world and in 2007 was designated one of the new seven wonders of the world. They had a nice viewing platform just below the statue and we were mostly able to make out the landscape below in the cloudy haze. 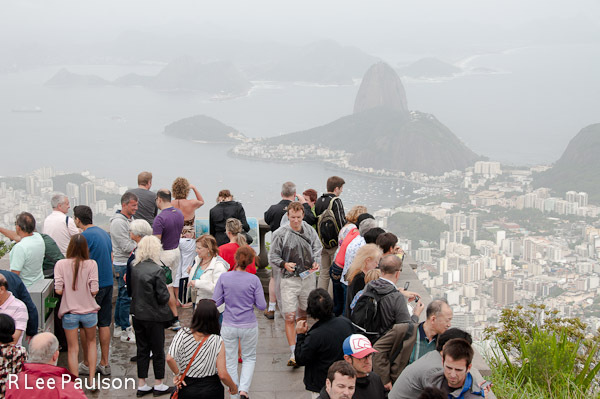 The peak just beyond the spectators is Sugarloaf Mountain, the one whose top had been obscured during our morning visit. 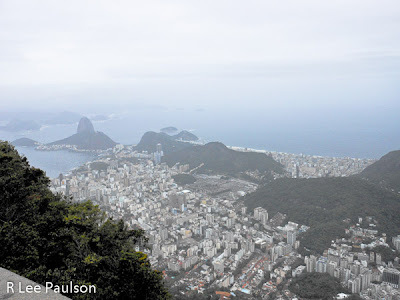 So, to give you an idea of the lay of the land, here again on the left we see Sugarloaf Mountain. To the right of it is Copacabana beach, which ends at the mountain/dark patch on the right. 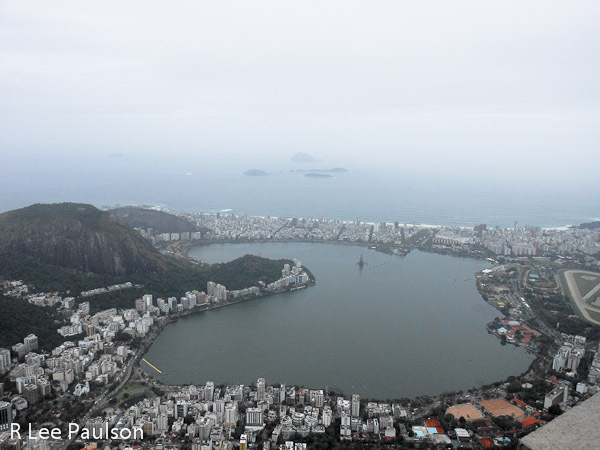 To the left, is Rio de Janeiro proper. To the right of Copacabana beach is Ipanema beach, which as you can see is basically a narrow strip of land between the bay and a large lake. We caught the train up to the top of Corvavado mountain just to the right and a little bit behind the area shown in this picture. Melony and I sat next to this couple during lunch. Nice folks who live just outside of London. We just assumed they were married when we ate and visited with them. But once we got up to the top of this mountain, we watched him hand her a small jewelery/ring box directly under the gaze of Jesus. She opened the box, then burst into tears and kissed him. The videographer, who shot videos of us during the day and then tried to sell us a DVD of our tour/adventure, got them to kiss again for him at the base of the statue. We never found out what the occasion was. They didn't offer. 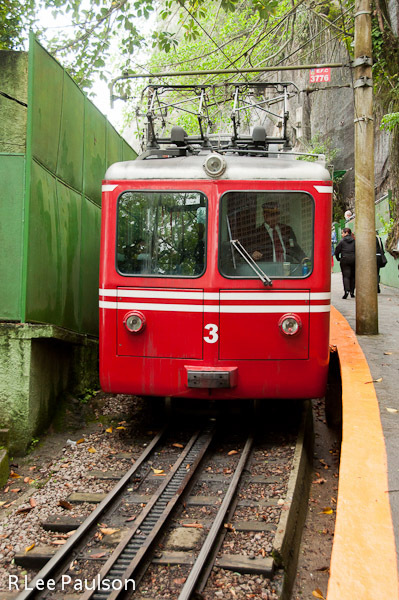 And both Melony and I felt it would have been rude to go up and ask them, as they were closely intertwined all the way back down the mountain. I included this image for three reasons. One, I'm an dedicated, unabashed people watcher. Two, it's always nice to see two people so much in love. And three, this is a great example that shows the diversity of experience we all create for ourselves during our time away together. What's not to like about that? Sorry, we digress. 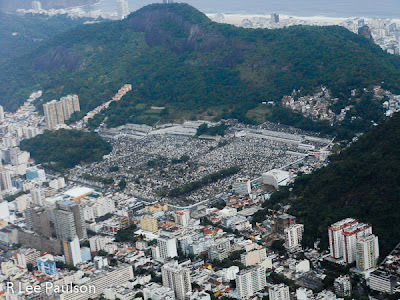 Right behind Copacabana beach is a mountain and behind that is a huge cemetery. I took this picture because this cemetery occupied more land mass than the area behind both Copacabana and Ipanema beaches combined. 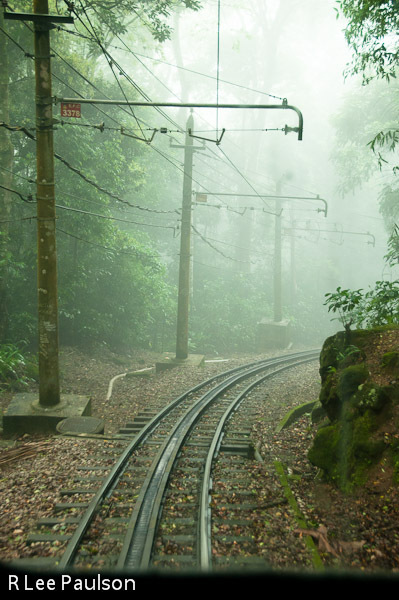 The path from the statue back down to the cog train wound through a dense patch of vegetation. 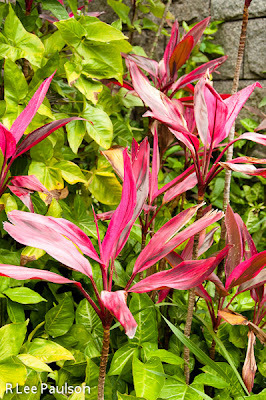 These flowers caught my eye. They were everywhere. 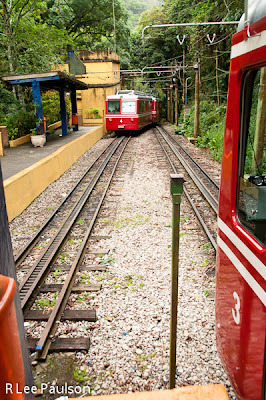 Here, another train coming up the mountain pulls off on a siding in order to let us pass. I managed to get a front window seat on the train for our trip back. 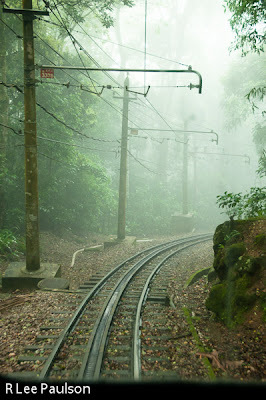 The way the tracks wound down through the mist made me feel as though I had just entered another world. 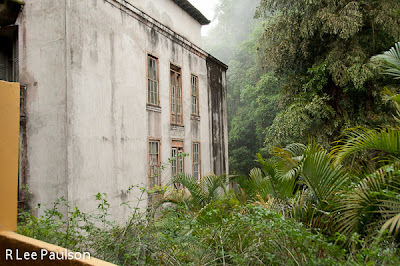 After passing the other train, we stopped at a station near this abandoned building. Sitting there, rotting away in the fog, covered in grime and soot from an obvious fire, with dense vegetation growing all around it, the place oozed intrigue and history. It felt haunted to me. I thought it might make a great setting for one of those suspense filled ghost or paranormal movies. 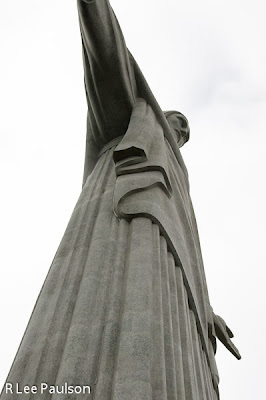 Continue on to Post 3: We walk along the Rio de Janeiro beaches, by clicking here.